The CLWA Annual Meeting was held on July 15. Business included election of officers and board members and discussion of topics concerning Crescent Lake... READ MORE. For a slideshow of pictures taken at the Annual Meeting: CLICK HERE. 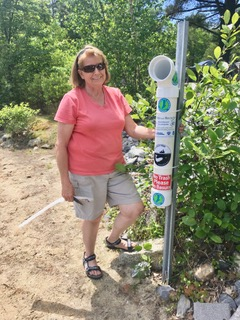 CLWA Secretary Pam Akers completes the installation of a monofilament fishing line recycling station at the Crescent Lake boat ramp on Sunday. CLWA first installed the station late last year in an effort to encourage anglers to use the recycling station rather than discarding unwanted fishing line overboard. Monofilament fishing line is not only hazardous to fish and birds, it can become entangled in the hubs of boat propellers and lead to expensive lower unit and outdrive repairs. CLWA is participating in the nationwide effort to reduce such hazards in our lakes and rivers.